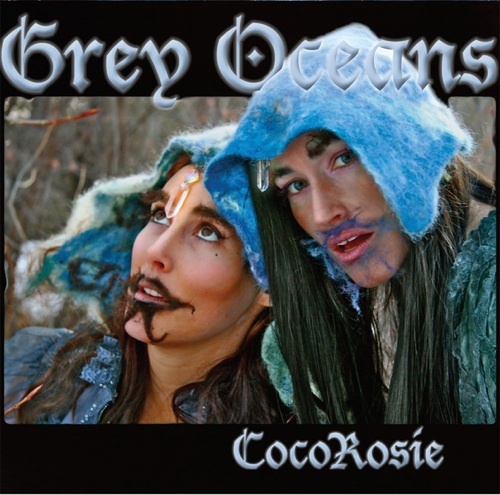 From the cover of CocoRosie’s latest album, Grey Oceans, which features the duo sporting Druid-ish cloaks and paste-on beards, one could deduce that the sisters have matured little from their days of singing about little Bambis and candy canes. And while flits of sophomoric frivolity remain on their Sub Pop debut, it is a largely sober affair. The Casady sisters have come a long way from their homemade debut, La Maison de Mon Reve, a strange yet beautiful collection of lo-fi folk gems. With each progressive outing, they incorporated a wider range of influences, steadily distancing themselves from the New Weird America movement of which they were once principle characters. 2007’s The Adventures of Ghosthorse and Stillborn showcased a growing interest in hip-hop, as they incorporated drum machines, electric beats and rap-styled vocals. Think of Grey Oceans as Kanye’s 808s & Heartbreak as informed by neo-hippy sisters, with a penchant for sampling sounds from vintage kids’ toys and operatic flourishes. There are pervading themes of melancholy and longing told through these disjointed narratives. The contrast in vocals between Bianca’s witchy croon and Sierra’s hauntingly pure operatic style has never been more pronounced. No CocoRosie album would be complete without a thoroughly eclectic amalgamation of songs. Lead-off track “Trinity’s Crying” features moody harp-focused verses that give way to synth-heavy choruses. Both the title track and the brilliant “Lemonade” are beautiful piano ballads that deliver some of their clearest and most focused lyrics. Hip-hop elements most exhibit themselves on tracks like “Smokey Taboo” and “The Moon and the Crow.” We even are given elements of trance (“Fairy Paradise”) and gospel (“Here I Come”). Both “Gallows” and “Undertaker” are reminiscent of the pair’s enchanting earlier material. And yet, despite the seeming disparity, throughout it all they maintain a steady ambience of dark wistfulness. This cohesiveness is the very thing that was lacking from previous efforts, and ultimately dulled their impact. Kudos to the Casadys for finally accenting their highly inventive songwriting in a unified manner.